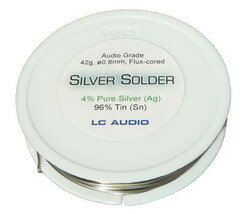 Solder with high silver content for audio circuits! This new solder has same high silver content (4%) as the 'old' silver solder from WBT. The lead contents has simply been replaced by tin - so the solder now complies with the EU RoHS directive and has substantially lower environmental impact. The silver solder is (still) flux-cored to provide optimal wetting and aid making high quality connections. An excellent solder for your high-end audio circuits! Page Build Completed in: 0.056 seconds. .